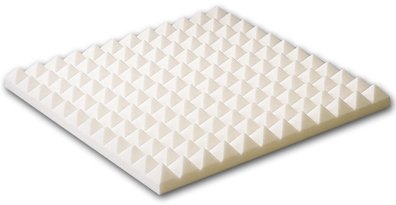 Another acoustic foam product, CornerCuts are acoustic foam bass traps, also known as corner bass traps, that free stand in the corners of a room to help combat low bass frequency noise. 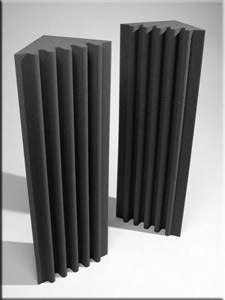 These three-sided sound panels stand 4’ tall with a fluted convoluted cut in the face of the panel to add to the absorption values of the panel. 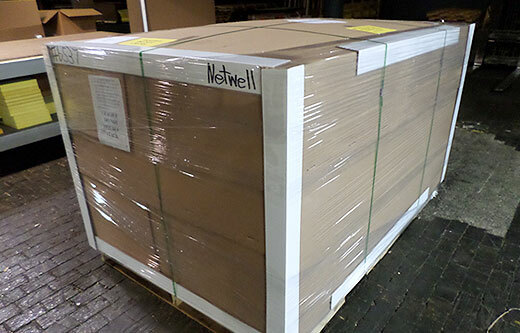 CornerCuts are cut from class A fire rated melamine foam. They are available in white, light gray or graphite gray in color. These corner bass traps are sold primarily to the music, recording and broadcast markets for curbing excessive low bass frequency noise that can collect in the corners of a sound room. CornerCuts are typically a supplement to a full perimeter wall treatment using our popular Pyramid or VCut acoustic foam panels. 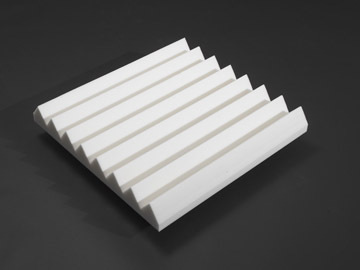 Cut from the same melamine foam, these wall panels are available in 2”, 3” and 4” thickness. If you opt for the thicker panel, it can negate your need to order the CornerCuts. The key to the success of your treatment lies not in where you position your sound panels in the room, but by ensuring you target the right amount of product. Use our Room Analysis to help define your treatment if you haven’t done so already! CornerCuts are sold by the panel for $140 each. They can be order by phone at 1-800-638-9355 or online using the link above. CornerCuts are designed to simply free stand in the corners of your music room. Stack 1 one on top of the other for a full 8’ reach to your ceiling, and place them in all 4 corners of your room. The Pyramid or VCut panels should be your primary focus with your treatment, and those sound panels can be glued to your perimeter wall space with silicone adhesive. CornerCuts will be shipped to your doorstep via Fedex. Be sure to inspect the order upon delivery and sign for anything that might appear to have been damaged during delivery. Use this innovative tool to determine the square foot coverage your sound panel treatment requires based on the size, shape and surface textures in your space.